每侧32块，包括肩胛骨 1 、锁骨 1 、肱骨 1 、桡骨 1 、尺骨 1 、腕骨 8 、掌骨 5 、指骨 14 。 Each side of the 32, including a scapula, clavicle 1, a humerus, radius 1, an ulna, carpal 8, 5 metacarpal phalangeal 14. (1)肩胛骨：呈三角形，分两面、三缘、三角。 (1) scapula: triangular points on both sides, three edge triangle. 后面有肩胛冈，末端延为肩峰，是肩部最高点。 Behind the scapular, the end extension of the acromion, is the highest point of the shoulder. 外侧角形成关节盂，参与肩关节构成。 The formation of the outer corner of the glenoid, constitute participation shoulder. 上角、下角分别平对第二、第七肋，是计数肋骨的标志。 Upper corner of the lower corners were flat for the second, seventh rib, is a sign of counting ribs. 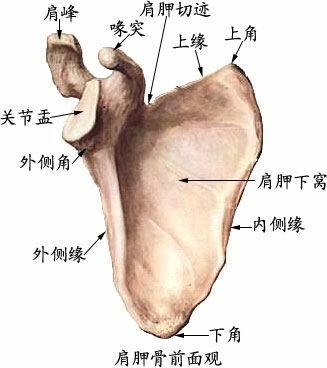 (2)锁骨：呈“ ~ ”形，内侧为胸骨端，外侧为肩峰端。 (2) clavicle: was "~" shape, the inner end of the sternum, the outer end of the shoulder. 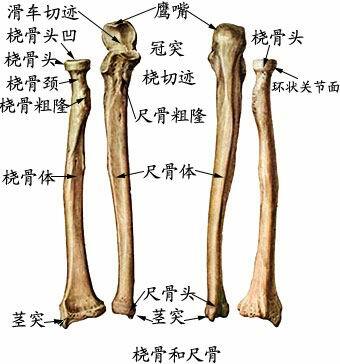 (3)肱骨：为典型长骨，分一体两端。 (3) of the humerus: a typical long bone, one of the ends of points. 上端为膨大的半圆形肱骨头，参与肩关节的构成。 Semicircular upper humeral head enlargement, participatory constitution shoulder. 下端有肱骨小头和滑车，参与肘关节的构成。 Lower end of the humeral head and the block, elbow constitute participation. 肱骨头外下缩细称解剖颈，肱骨上端与干交汇处为外科颈，因此处最易发生骨折需去外科治疗而得名。 By narrowing the humeral head, said outside the anatomical neck, and proximal humerus surgical neck Interchange dry, so at most prone to fractures require surgical treatment named. 肱骨干后方有桡神经沟，有桡神经通过。 There humeral rear radial nerve sulcus, have radial nerve through. 肱骨下端内上方后面有尺神经沟，有尺神经通过。 Back above the lower end of the humerus ulnar nerve groove, ulnar nerve through. 肱骨主要结构可归纳为两头、两颈、两沟。 The main structure of the humerus can be summarized as two, two-necked, two ditch. (4)前臂骨：包括内侧的尺骨和外侧的桡骨，习惯称为 内尺外桡 。 (4) forearm: including radial ulnar medial and lateral, commonly called inner-foot radius. 1)尺骨：为一上大下小的长骨。 1) ulna: the next big small for a long bone. 主要结构有鹰嘴、滑车切迹、尺骨头、桡切迹、尺骨茎突等。 The main structure of the olecranon, pulley notch, foot bones, radial notch, ulnar styloid and so on. 2)桡骨：主要结构有桡骨头、尺切迹、桡骨茎突等。 2) Radial: The main structure of the radial head, ulnar notch, radial styloid process and so on. (5)手骨：包括腕骨、掌骨、指骨。 (5) Shougu: include carpal, metacarpal and phalangeal. 1)腕骨：8块，排成远近两列。 1) wrist: 8, arranged in two distance. 近侧列由外向内依次为手舟骨、月骨、三角骨、豌豆骨。 Outside-hand column followed by the proximal scaphoid, lunate, triquetrum, pisiform. 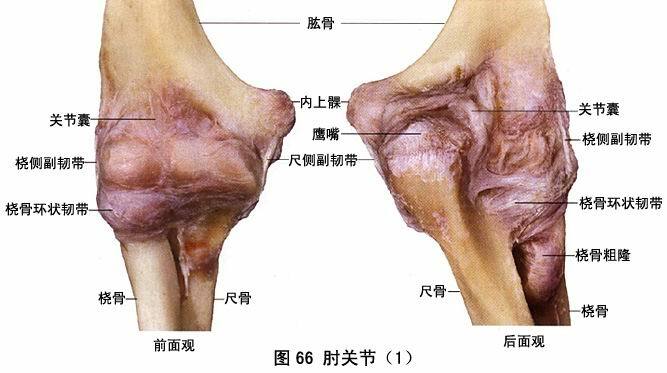 远侧列由外向内依次为大多角骨、小多角骨、头状骨、钩骨。 Most were from outside to inside the distal row angular bone, trapezoid bone, bone-shaped head, hamate. 2)掌骨：由外向内依次为1、2、3、4、5掌骨。 2) metacarpal: 1,2,3,4,5 metacarpal were from outside to inside. 3)指骨：14块。 3) phalanx: 14. 拇指为2块，其余各指为3块。 Thumb for two, the rest of the finger for three. 1)构成：由肩胛骨的关节盂和肱骨头构成。 1) composition: the glenoid and humeral head constitute scapula. 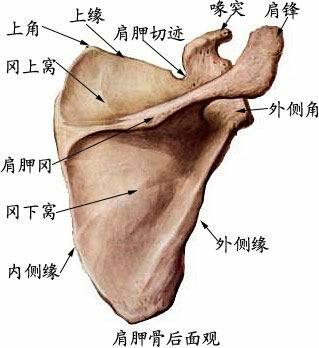 2)特点：①肱骨头大、关节盂较浅小。 2) Features: ① humeral head large, small shallow glenoid. ②关节囊松弛、易向前下脱位。 ② capsular laxity, easy forward to the next dislocation. ③运动灵活、稳固性较差。 ③ flexible movement, poor stability. 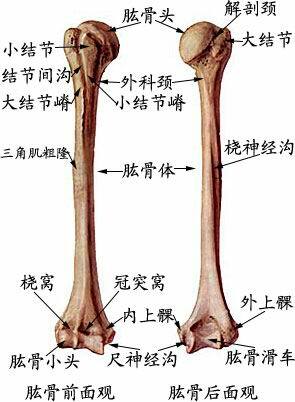 1)构成：由肱骨下端和尺、桡骨上端构成。 1) composition: the humerus and ulna and radius upper end of the composition. 2)特点：①一个关节囊内包括三组关节,即肱桡、肱尺、桡尺近侧关节。 2) Features: ① an articular joint capsule contains three groups, namely, brachioradialis, brachial foot, proximal radioulnar joint. ②韧带有固定桡骨头的桡骨环状韧带和尺、桡侧副韧带。 ② ligament fixed radial head of the radial annular ligament and ulnar, radial collateral ligament. ③肱骨内、外上髁与尺骨鹰嘴三者在屈肘关节时呈三角形，伸肘关节时呈一条直线。 ③ within the humerus, the lateral epicondyle and olecranon elbow flexion during the three triangular stretch elbow when a straight line. 手关节包括桡腕关节、腕骨间关节、腕掌关节、掌指关节、指骨间关节等。 Hand joints including wrist joint, inter-carpal joints, carpometacarpal joint, metacarpophalangeal joint, inter-phalangeal joints.